Awnings have been around as an architectural staple for centuries. Awnings were born from the need to create shelter and shade against a hot and brutal sun. From Egypt to Rome, and eventually the United States, awnings were popularly used for businesses in order to provide temporary relief to patrons during outdoor markets in a pre-air conditioned society. Awnings went out of style after air conditioning changed the way businesses operated. Now, businesses don’t need awnings to entice customers to their outdoor stalls, instead indoor storefronts could be utilized. However, awnings made a comeback due to their nostalgic charm and the sudden increase of shoppers wanting outdoor shopping complexes. Nowadays, awnings are functional as well as an eye-catching addition to any building or home. Different shapes, styles and materials can be selected to bring out any type of architecture. Awnings are perfect for people living in hotter climates that want to be outdoors, but still want to keep cool. The reinvention of awnings has made them available in a multitude of different styles. Before purchasing, learn about which style is best for your home. As the name suggests, this awning will stay put. Permanently installed to your home, a stationary awning is a good idea if you live in an environment that gets sun year round. This style is popular for many Southern homes as it protects against the constant barrage of heat and sun. Do you live in an area that gets hit with the weather of all four seasons? Then a retractable awning could be the best option for your home. Awnings will collect leaves, debris, snow and even catch those occasional big gusts of wind, so the option to retract the awning during adverse weather is beneficial in making it last. The motorized awning is a high-tech version the retractable awning, and is perfect for those who don’t want to mess around with pulling the awning back yourself. Some styles of motorized awnings even have a sensor that can detect rain and will retract or extend appropriately. With everything being technological in this day and age, why not awnings? An awning has many different parts. Some parts may differ depending on the style of awning. Retractable and motorized awnings have more parts than a stationary awning, and can be more complicated to replace, but it’s still doable, nonetheless. This part is the attachment of the awning’s fabric to the framework. It consists of the molding, which is a track system that latches the fabric onto the frame. Lacing, screws and staples help anchor and secure the fabric, preventing it from movement. The substrate is where the actual framework is attached. The substrate is an underlying surface beneath the frame, further ensuring the stability of the awning. Awnings come in a variety of different shapes. The shape of the awning framework is an essential part of an awning. This is one of the most common shapes for an awning. The shed shape is highly versatile and the pitch can be changed for any structural style. The concave shape of this awning style has a slight curve in its middle. This makes for an eye-catching design that looks great on any architecture. Convex awnings have a middle curve that is the opposite of the concave awning. It’s shape is also known as a waterfall awning. Perhaps one of the most traditional shapes of an awning, the dome awning has been around for centuries. This interesting shape sets this awning style apart from the others. The valance hangs below the awning framework, it’s meant for decorative purposes. Valances help embellish the look of an awning; sometimes the fabric of the valance is scalloped at the bottom for an ornamental look. Retractable awnings will typically have a pulley system that allows the awning to expand and contract. Ropes go through the pulley and can be pulled by the operator. For motorized awnings, there are more gears and parts involved but it has the same functionality as a retractable awning, the difference being the expanding and contracting can be done with a remote rather than manually. These anchors fasten the awning to the surface of the building. A hole is drilled into the brick, concrete,or other material, and the expansion anchors are inserted into the holes to hold and support the awning. Anchors can be made out of a variety of materials, like epoxy or aluminum. The arms of an awning offer support and angle off of the sides of the awning to the building it’s attached to. Arms are often made of a strong material in order to make sure the awning is not easily moved by wind or other outdoor elements. Awnings are available in many different kinds of fabric. Depending on your geographic location, some fabric options may be more beneficial than others. If you live in an area that is hot, humid and wet for the majority of the year, then you may want to select a fabric that’ll resist mildew and waterproof. Awning fabrics can be made from polyester and vinyl blend, and this composite of these two materials are a lightweight and durable, making it a popular choice. Polyester and vinyl tightly fit over the framework, giving the awning a secured fit. Acrylic fabrics are more heavy duty than cotton blended fabrics. Although acrylic fabrics do repel water, they’re not completely waterproof, just water resistant. Many people choose acrylic fabrics for their awnings for areas that are prone to high levels of humidity because acrylic resists the formation of mildew. Awnings don’t have to be made from fabric, they can also be made from aluminum, wood or other sturdy materials. Metal awnings are extremely durable, but they require a lot of maintenance. Metal has a tendency to rust, and during the warmer seasons, can retain heat. Despite its known durability, many people still prefer fabric awnings as opposed to metal due to fabric of any blend being a lower maintenance option. Awnings are a functional way to cool off and keep shelter from rain and wind. 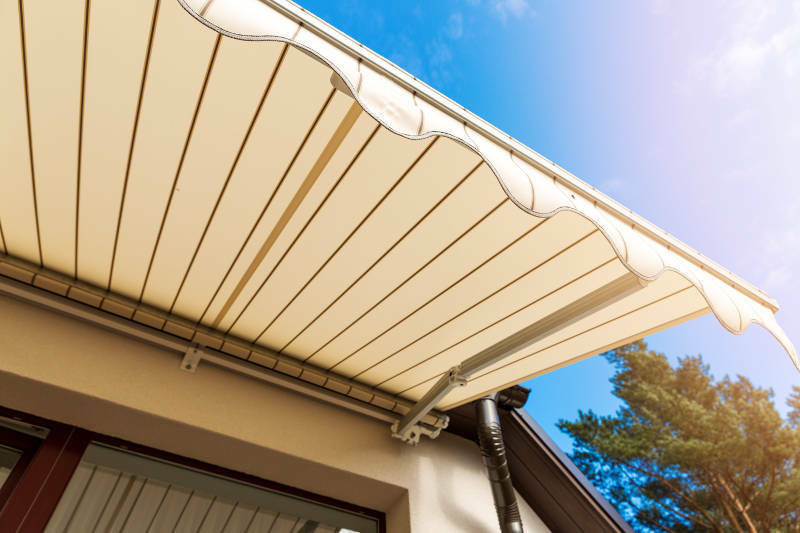 The many styles of awnings have similar parts, but with retractable awnings, there are more moving components that require more parts to operate. Fortunately, awning parts can be easily found online or at your local hardware store. Parts for any style of awnings are usually a low cost. To replace the parts of your awning, you can find guides, videos and how-tos online, no matter what type of awning you may have. Retractable, traditional, or motorized awnings all are a great way to provide shade outdoors. Awnings can reduce temperatures by a few noticeable degrees during hot weather. This can create more energy efficiency in your home or business in which the awning is affixed to. If you need awnings for your windows, doors or patio, you’ve come to the right place. Early Times offers awnings for all situations. Whether they’re right above your windows and doors or a retractable awning for your patio, we’ve got you covered. Get a free quote now.